Shelby is Rural Vermont’s most senior staff, having been with the organization since 2006. She was hired as Organizer, transitioned to Outreach Coordinator, and most recently became Development & Outreach Director. Shelby manages Rural Vermont’s fundraising campaigns, oversees communications, plans events, and fills in gaps as needed. She believes vibrant communities can save the world, and loves her job because of Rural Vermont’s role in building these robust and resilient communities. Shelby lives in Brookfield with her husband and two young kids. When she’s not working, she can be found in the garden, at Brookfield’s Old Town Hall, in the kitchen, or blowing bubbles with her kiddos. Coco brings to Rural Vermont a deep love of Vermont’s small farms and a commitment to building a strong and accessible regional food system. She manages the office, memberships and the website and will likely be the one to answer the phone when you call. Coco has a couple of degrees tucked into a drawer somewhere but enjoys working with animals and her hands much more! Her side projects include training an unruly draft pony, and trying to keep the upper hand on all the projects around the rocky Lincoln homestead she shares with her husband and a menagerie of creatures. Ben was born in St Albans, and raised on a 165-acre homestead in Enosburg. He is the author of five (soon to be six) books, writes for numerous periodicals, teaches writing to people who invariably teach him more than he teaches them, and operates an extremely diversified homestead farm with his family in the Northeast Kingdom village of Stannard. He keeps a hand in as many Rural Vermont projects as possible, including fund-raising, strategizing, community organizing, and outreach. He believes fervently in the power of community-scale agriculture as an antidote to the ongoing erosion of health, environment, and equality in the modern world. Graham served on the Rural Vermont Board for a number of years before transitioning to a part-time organizing role in January 2017. Graham’s work at Rural Vermont focuses primarily on grass roots organizing, coalition development, and policy. Graham grew up in East Montpelier and currently lives in Plainfield, VT. 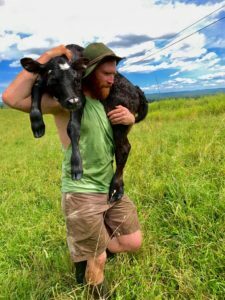 He is an educator and herbalist, and co-owns a seasonal grass fed and finished beef operation (Robinson Hill Beef) and home-to-farm scale agroecology design / build business (Walking Onion). Graham has been working with youth in a variety of settings and organizations in Vermont including: ROOTS School, EarthWalk, The Maplehill School and Community Farm, and the King Street Youth Center. He is currently looking for land to live, grow a family, farm, and educate on. He graduated from UVM with a degree in Religious Studies and Plant and Soil Science; has a Permaculture Design Certificate from Yestermorrow Design / Build School; and attended the 3 year clinical herbal training program at the Vermont Center for Integrative Herbalism. Mollie spent 2010-2016 working in various capacities for Rural Vermont, primarily managing operations and supporting community and member relations. She returned to the organization late in 2018 to cover for Coco during her family leave, and continues to provide administrative and organizing support. She firmly believes that a just and dignified agricultural economy based on regenerative practices is the backbone to resilient communities and healthy ecosystems. Caroline was born in Germany and came to Vermont to engage in changing the law so that sustainable farming practices become economically viable. She recently graduated with her LL.M. in Food and Agriculture Law and Policy from Vermont Law School and joined Rural Vermont this January. During this legislative session, Caroline reports to Rural Vermont about the procedures in the State House, especially in the Agricultural Committees. Before coming to Vermont, Caroline participated in a four-year training program in biodynamic agriculture in Germany. Aside from advocacy work, Caroline wants to maintain farming herself in a way that increases communal participation and collaboration among producers.